Carbon pollution in advanced economies is on the rise after five years of falling. It was good effort while it lasted? The International Energy Agency made the announcement on Tuesday as countries from around the world gathered in Poland for coal-laden climate talks. The news doesn’t bode well for the climate, which could spiral into a state unseen in all of human existence if carbon emissions aren’t reined in soon. 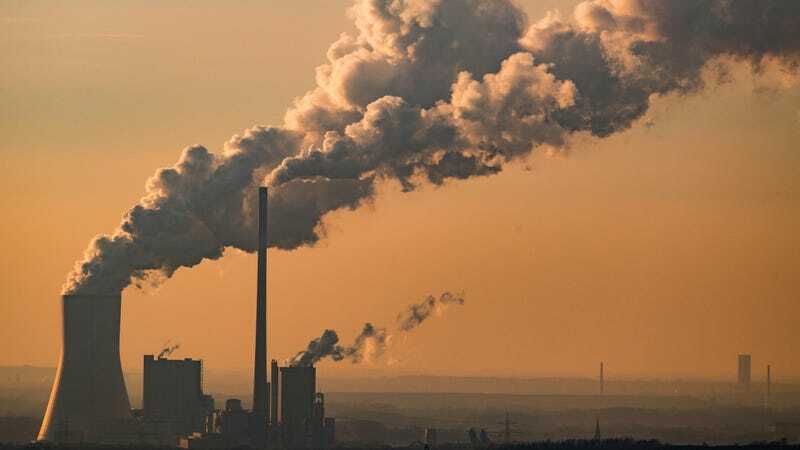 The group reports that emissions are set to rise 0.5 percent this year in 35 advanced economies around the world, a group which includes countries in Europe and North America, as well as Japan, Australia, and New Zealand. The small but notable uptick comes after five years when energy-related emissions fell roughly 3 percent in those same countries. An IEA spokesperson told Earther that emissions rose because oil and natural gas use outpaced the decline in coal consumption and increase in renewable capacity, and that a country-by-country breakdown would be available in March 2019. Regardless, the rise in emissions illustrates a few things pretty neatly. The first is that if you want to put another nail in the whole “natural gas is a bridge fuel” coffin, please feel free. While certainly not as carbon-intensive as gas, it’s becoming increasingly clear that natural gas will not get the world to where it needs to be emissions-wise. The rise in emissions tied with oil use also reflects the fact that transportation emission continue to be a huge problem. In the U.S., for example, transportation emissions have seen among the most notable upticks in recent years. Electric vehicles can help stem some of that rise, but despite rapid growth, they’re still just a tiny fraction of the cars sold worldwide. Lastly, it’s impossible to ignore that developed countries are nowhere near installing renewables at the scale needed to make a dent either. Sure, corporate giants like Facebook and Apple are running largely on renewables. But large portions of the economy still run on fossil fuel energy, and continuous growth ensures that we’re still fighting a losing battle. This follows news last year that global emissions also rose in 2017 after a three-year plateau. Combined, these trend shows that while there was some hope we’d hit peak carbon emissions, that’s just not the case. And the increase in emissions couldn’t come at a worse time. The world needs to slash its emissions 45 percent by 2030 and net zero by 2050 in order to keep global warming to within 1.5 degrees Celsius of pre-industrial levels. The more emissions rise, the steeper the cuts will have to be in the coming years if the world is to meet that challenge. “This turnaround should be another warning to governments as they meet in Katowice this week,” Faith Birol, IEA’s executive director, said in a statement announcing the uptick. Announcing the news during international climate talks lays out the stakes for negotiators pretty clearly. While developing countries—and small island nations in particular—have been calling for higher ambition to curb carbon emissions, this year’s conference so far feels far from delivering it.